How do I access 5kits? The Internet is not the oasis of free speach it once was. Over the years it has been gradually transformed into a censored marketing tool. It came so far that nowadays the domain registrars have to block their customers domain names when being ordered to do so. Over the years we have been losing domains regularly and people who wish to find us have to put in some effort to do so. Until true decentralization of the internet restores its censorship resistance 5kits domains will keep chainging. If you are using the tor web browser, make sure to periodically check for updates and always use the latest version. How do I know which 5kits is real and which are the scam sites? 5kits has a copycat scammer who is targeting our customers. But why whould someone fake us? People who operate the 5kits system have been in this business for almost 20 years. We were the official distributor of Jintropin for 10 years and we still are the official distributor of Hypertropin (since 2007). Actually we are the only online place to buy authentic Hypertropin. During the years people have come to rely on the quality of our products, service, security and privacy. The HGH market is an extremely dificult field to survive in. The only reason we are still here is because our customers stick with us. The 5kits system used to be located on 5kits.com domain however in March 2014 our domain was disabled by the domain registrar Enom under the order from Legitscript (a US agency who tries to enfoce western big pharma monoply on the internet). We were thus temporarily taken offline and our customers had difficulty finding us for a while. Why does the real 5kits use multiple domain names? Several of our domains (including 5kits.com) have been disabled/blocked by registrars under instructions of Legitscript - an agency which keeps Asian competition away from western markets in order to secure the profits of big pharma corporations. This is done under pretext of protecting the people from "harmful generics" and unlicensed "rogue" online pharmacies. How does one obtain a world-wide internet license and who is the authority for this? The only way to meet the criteria is being a western based business, selling only big pharma products. We are thus disquallified even though our products are at lest identical if not superior while far more affordable. Depending on the location of the domain registrar and the domain's extension, some can be confiscated more easily than others. The point of 5kits multiple domains is to scatter them around on various registrars and different extensions. If some are lost, they can't all be blocked at the same time. We can create them faster than they can be pulled down. And if his ever changes, we will adapt (we have a few ideas in the works). How do I know you are the real Zhao Yong and which set of 5kits sites is real? Since we published this website the scammer has been trying to adapt and has since come up with his own "scam busting" explanation site (zhao5kits.com). The sheer amount of work he is dedicating to keeping the scam going is surprising and worrying. We used to think if we just ignore him he would eventually go away. Unfortunately that was a mistake on our part which we are working on rectifying. 1. Every internet domain name has a public "Whois" record. Among the info listed there are the date of the initial domain registration and the owner's email address. There are many "domain whois" service websites (example: http://whois.domaintools.com/ or https://who.is) where people can check the info of any domain. 2. The first and original 5kits domain was 5kits.com (registered on 6th of July, 2011). Although it got blocked by the registrar in 2014 the domain still exists and it's whois information is public. Take a look at the registrant's email address - it's "info at 5kits.io" (our current domain). 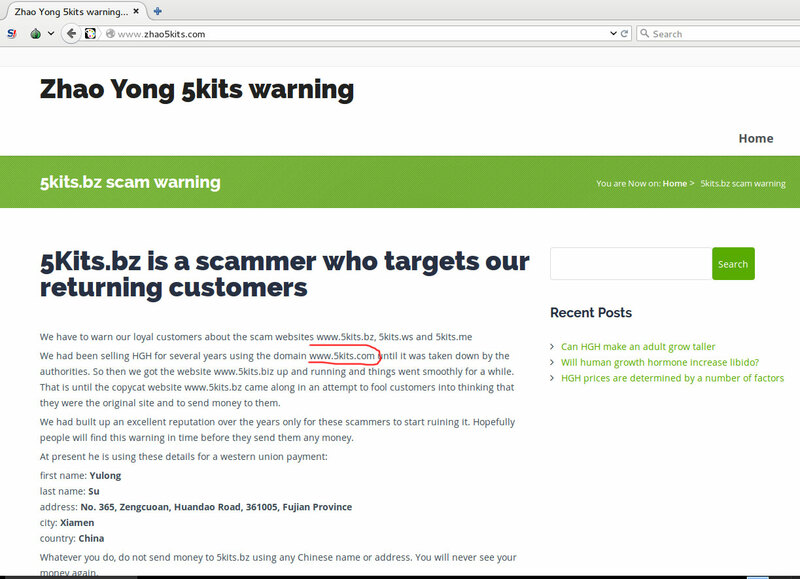 The scammer published a "scam busting" page at zhao5kits.com where he lists our domains as scam and his as the real deal. He made a mistake of confirming that 5kits.com was the original 5kits (which is true). Here is a screenshot in case he removes it after reading this. The original domain although blocked, is still owned by us. This means that even the scammer let the truth slip by mistake. 2019 Update: The public domain info of 5kits.com has since been censored by the domain registry, so none of the info is visible anymore. 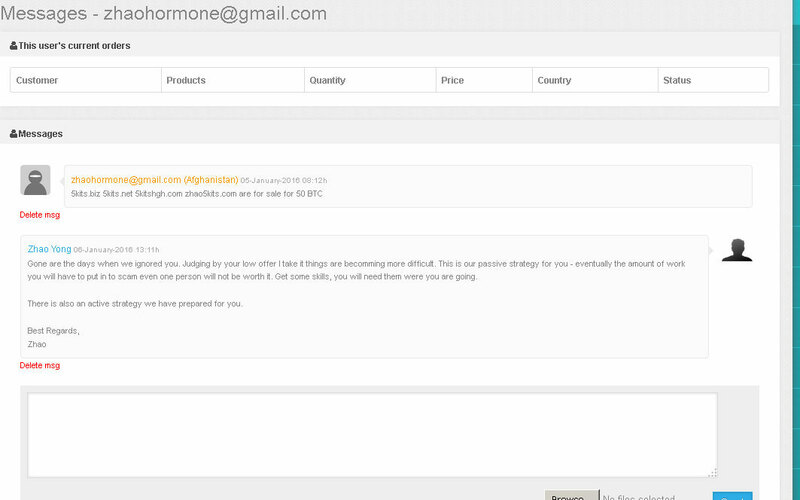 Asian suppliers first started selling HGH on the internet in the late 1990's. The big pharma didn't care, as they had laws in place which made sure the western doctors may only prescribe FDA approved (big pharma) brands. The internet wasn't a problem yet as online shopping was not as popular. The HGH was perfectly legal to use, buy, sell, even import as long as it's for personal use only. Rich people used it for anti ageing, athletes used it to gain advantage in sports and bodybuilders used it pretty much all year round. HGH was in popular use for 30 years until in mid-2000's, big pharma noticed that people have started trusting and importing Asian brands (Jintropin, Hypertropin) in big quantities. They lost a substantial portion of the market share and something had to be done about it. Suddenly a few athletes were caught doping, Sylvester Stallone got caught with Jintropin in an Australian airport, followed by a few months long media campaign, demonizing HGH as dangerous in every way imaginable (unless prescribed a safe big pharma brand by a western doctor - in that case it was good for you). Then the "big brother" stepped in to protect the people from the "dangerous HGH" and made it illegal to import from Asia, period. Gensci (the manufacturer of Jintropin) got their funds seized, the CEO was wanted for trial in the USA and the manufacturer briefly got their licence revoked in China until politics were resolved. When the dust settled, Jintropin was replaced on the market by Hypertropin, dozens of new HGH brands and hundreds of new online pharmacies appeared. Eventually we were surprised when our domains were confiscated by Legitscript (online enforcerer of the big pharma industry). For us this signalled the era of internet censorship and the need for encryption, ToR network, Bitcoin and the need for advanced technologies which will return freedom of choice to the people. If at some point all of your sites dissappear from the internet again, how will I recognize your new ones? Below is our public PGP key, save it. It's fairly easy to learn how to encrypt messages using PGP (see youtube tutorial videos). When you ecrypt a message using someone's public PGP key, only the person who has the private counterpart key can read it. Ask the new 5kits or Zhao to decrypt your message using this PGP key. If he can, you have found me. Who is the 5kits scammer? The scammer is currently asking people to send payment to "Neil Godfrey" or "Gary Neil Harrisson" in North Square, Dorchester, United Kingdom but the names will likely change in the future as the old ones get banned. Please report them to us and to Western Union. It appears that all the listed 5kits scam sites are operated by the same people. Their webhosting and domain registrars are not responding to take-down requests and reports. If you have been scammed by the fake 5kits, below is a list of the companies which share the responisbility. They continue to keep the scam sites online. Even before the above mentioned scammer/copycat and before we named our system "5kits", we were losing about 20% of the would-be new customers due to sabotage posts by competition in various internet forums. Anyone researching HGH would eventually run into us. If our competitors were to make any sales, they had to first discredit us in forums and reviews. For cautious people, one negative review outweights ten positive ones, even if the reviewer's intentions are obvious - the same person bashing us would continously advertise another supplier in most of his other forum posts. Forum resellers sold their products exclusively to the forum people - where a standard practice was to create multiple accounts which were then used to sabotage their rival's reputation. We learned to live with this cancer because it was impossible to repair the damage by clearing our name on the same forums. When attempted, the debate would heat those threads up and bring even more exposure to them (the made up forum accounts had nothing to lose only our good name was on the line). I remember lef.org had a bad thread about me more than 10 years ago. Over the next 6-7 years that one single thread has turned thousands of people away from us and likely many ended up buying low quallity HGH from the forum pushers, which in turn made their experience dissappointing and they likely gave up on HGH alltogether. So there was double loss and no solution to this problem. Overall majority of reviews about us were positive, so people willing to do some research still ended up meeting us. Unfortunately stuff like this will remain on the internet for years to come long after the scammer has been exterminated. "5kits.com" was just a domain name we came up with for our sales/support system. It aparently grew into a brand. We underestimated its importance until someone else started taking advantage of it. Lately we noticed a drastic fall in the number of new customers. Several returning customers who have been with us for years have reported being scammed by the fake 5kits. The online reviews of 5kits are now tarnished with "scam" added everywhere. Unfortunately many people don't bother to read past that keyword. Basically we have been sabotaged and are slowly recovering with the help of this page. After 5kits.org page caused a dip in the scammer's finances he contacted us and offered to go away in exchange for 50 bitcoins (screenshot here). Thank you for taking the time to read all this. Hopefully it saves people from getting scammed.